Pathrodo is a delicacy made in every Konkani home. 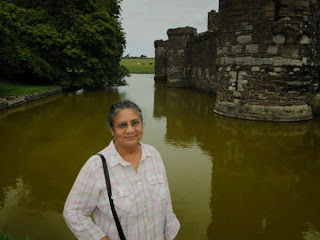 Today's guest post is by my friend Bharathi Shenoy who shares her recipe for making this old but all time favourite. 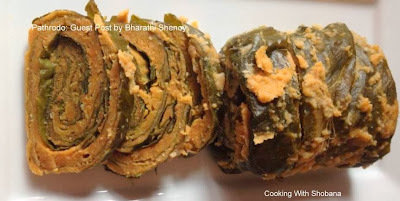 This dish is made of colocasia leaves and is immensely popular. To prepare the leaves- You will need 15-20 leaves, depending on their size. Wash the leaves and let them dry. Then trim the midrib and all the veins . Then with a wooden spoon press against the midrib and the veins to mash and soften them. The leaves are now ready for use. Remove all the water from the soaked rice, and dry grind it to make rava of it. Keep aside. Now grind finely the coconut, red chillies, hing and tamarind to a smooth paste. Add the soaked toovar dal to the ground paste and grind further with just enough water to make a smooth thick paste. Add the rice rava to it, add salt and mix with a wooden spoon till well mixed! This masala is now ready for application to the leaves. Take two leaves and place them side by side one slightly overlapping the other. Next, place two more leaves on the lower edge of the above leaves, so a square of overlapping leaves is formed. Apply the masala on the leaves making sure it is spread all over and in between the overlapped parts too. Now place one more layer of leaves over the masala . Apply the masala again over the leaves so a square with two layers of leaves and two layers of masala is ready. Fold the left and the right side edges of the square inwards. Starting at the bottom of the square, roll the leaves into a tight roll. Keep applying a little masala continuously as the underside of the square of leaves becomes visible while rolling. Tie the roll with a string in two or three places. Cut the roll into two, if it is too long . I am sure you will enjoy this Konkani delicacy. Thanks, Bharathi for this recipe.